I recently received Kingzone K1 Turbo Android smartphone for review. It packs an octa-core processor, 5.5-inch display, full metal chassis, and some goodies that would surely attract any tech junkies out there. Kingzone is a manufacturer based in China and while it has already released a few products in the past, its campaigns were never that successful especially that tech magnate such as Samsung and Apple largely dominated the mobile market. The Kingzone K1 Turbo, however, is a game-changer for the company...well, hopefully. Before anything else, I would like to personally express my gratitude to Chinavasion.com, wholesaler of electronic devices and gadgets, for providing one unit of Kingzone K1 Turbo for review. I received a black-colored unit and it doesn't have any other colors visible anywhere on its cover except for prints, of course. K1 Turbo is known as "Iron man" of smartphones because it has a full-metal chassis and back cover, so don't expect it to be as light as those plastic smartphones like Galaxy S3 and S4. Its weight was sacrificed to make the device more durable. In front, 95% is covered with tempered Corning gorilla glass, which meets with the top and bottom rounded plastic caps. The left and right sides of the phone reveal its durability as they immediately show the metal frame of the phone. The left side is where the USB / utility, Qi wireless charging interface and 3.5mm headphone jack are located. On the right side are Volume and Power keys. K1 Turbo may have similarities with the design of other China phones but its minimalist design and noticeable durable built are factors that would make it standout above the rest. More often, phones with bigger screens have mediocre picture but not this one. While it has a 5.5-inch display panel, Kingzone made it a point to give it 1920 x 1080 pixels FHD resolution. So, basically, it has around 480 ppi, which is high enough for a China phone. K1 Turbo uses Sharp's LTPS display panel. Needless to say, it's display is impressive with realistic colors and you can use touch command even with wet fingers. Yes, I've tried it and its response is as smooth as when your hands are dry. Its impressive display panel is, of course, protected with 3rd generation Corning gorilla glass. I didn't bother to install the screen protector to maximize the sensitivity of the screen. One thing I noticed is that the display doesn't heat like other smartphones. One of the main reasons why I was so interested in reviewing this phone is because it has an octa-core processor. I'm always attracted to powerful smartphones like this one. It uses Mediatek's MT6592 chip, which has 8 completely independent cores. It also incorporates a quad-core GPU that allows Full HD resolution and excellent graphics. It's powerful processor is backed up by a 2GB RAM and 16GB internal storage. Kingzone also used Sony's 14-megapixel sensor for the primary camera, while the front camera enjoys the 8MP sensor. People who loves taking selfies would surely love this phone as it also has its built-in filters and modes. One feature that you can't find with other China phones is Air Gestures. With the help of Sharp's four-directional sensor, you can answer calls, scroll pages, or switch interfaces with the wave of your hand. Other things worth mentioning is that, Kingzone K1 Turbo supports Qi wireless charging, NFC and it uses Yamaha's HiFi audio codec for better and clearer audio. Lastly, the 2,500mAh battery. Considering the efficiency of its processor and display panel, its battery is more than enough to power the device for more than a day of average use. Gaming can reach up to 4 hours and music with the screen on can go on up to 10.5 hours. 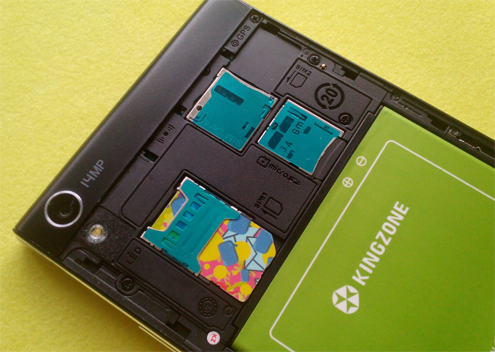 Kingzone K1 Turbo runs Android 4.3 Jelly Bean. The company didn't disclose any information as to future updates for the device but if there's none, it's understandable for China phone. So far, I didn't encounter force closes and the phone is buttery smooth with its default setup and interface. I tried installing heavy games, run them in the background and switch between them over and over and K1 Turbo does the job with ease. Kingzone K1 Turbo is a premium Android phone with impressive specs and built. If it had a Samsung label on it, I'm pretty sure its price will be between $600 and $800. For people who are not after the brand, this phone may be for you. Again, I would like to say thanks to Chinavasion for providing this review unit. There are more Android devices like this one on their website, find one that would fit your lifestyle.